Male Transformation Of The Week - Lee Hayward. 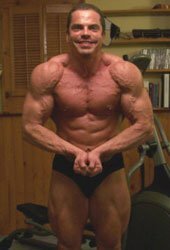 How Lee Hayward lost 42 pounds and won the overall title in a bodybuilding contest. Learn more about this fantastic muscle building/fat loss transformation. Check out his sample training, nutrition and supplementation details below! 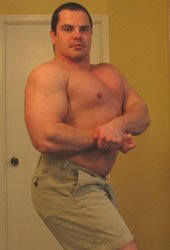 I started working out when I was 12-years old. 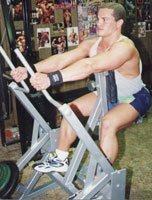 In 1990 my dad gave me a home gym for Christmas, it was a York 2001 machine and a York barbell and dumbbell set. My dad has always been active and worked out his whole life so this really helped motivate me early on to workout and keep fit. 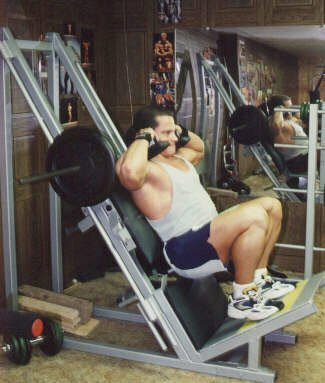 Once I had my little home gym set up in the basement I was hooked on working out from that point on. I would workout daily by following the "York Workout Courses" that came with the equipment. Sometimes I'd workout for several hours at a time. Looking back at it now I know that working out that long and often wasn't the smartest thing to do. But I was so motivated at the time that I made pretty good gains training the way that I was. I can remember thinking to myself at the young age of 12. "If I do this everyday until the end of the school year I'll be as big as Arnold in the Conan movies." So I set a goal for myself that I would workout every single day now matter what. I faithfully stuck to that goal. Even if we went out of town to visit family and I never had access to any gym equipment, I would still do push-ups and sit-ups to make up for missing my weight training workouts. Well, I did workout everyday for the rest of the school year. But as you can imagine things didn't turn out as I planned, I never got as big as Arnold. But at the end of my first year of weight training I was a lot bigger and stronger than I was when I started and this motivated me to keep on working out. 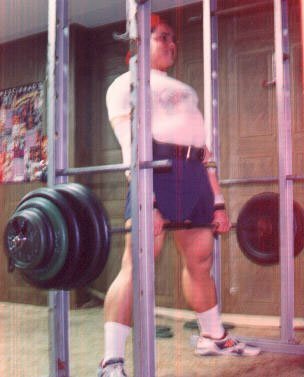 During high school I worked out consistently and I would read every bodybuilding and fitness magazine that I could get my hands on. I'd get bodybuilding and exercise books from the library. I would record every bodybuilding contest that was on television and watch them over and over again. I was obsessed with learning as much about bodybuilding, exercise and nutrition as I could. Magazine I Could Get My Hands On. 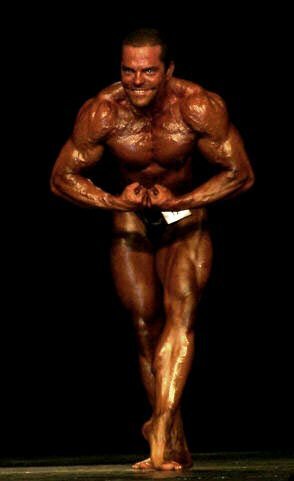 While in my last year of high school I entered my first bodybuilding contest, The 1995 Newfoundland Provincials; I was 17-years old at the time. And since then I have competed almost every year in bodybuilding competitions. 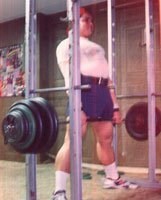 My dad was so supportive of my bodybuilding training that he even took some night courses at a local trades school and studied welding. And then together we made a complete high quality home gym for our basement. He'd do the welding and I'd be his assistant. And I'd Be His Assistant. We made a power rack, a leg press / hack squat machine, dip / leg raise station, T-bar row, calf raise machine, and a hammer strength style seated row machine. 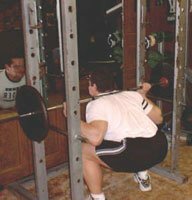 I trained in our home gym for 8 years straight before eventually moving on to a commercial gym. Competing in bodybuilding competitions has been a huge motivating factor that has helped me stay consistent with my workouts over the years. I know that I don't have the genetics to turn pro, but I still love to compete on the local and regional levels. I know from experience that you'll never be as consistent with your diet, training, and cardio as when you are preparing for a bodybuilding contest. Even though I love the sport of bodybuilding and have worked really hard to build my physique over the past 17 years. 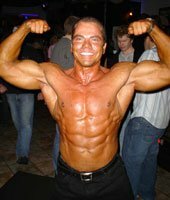 I've never ever won a bodybuilding competition before. I've always placed high, I've even gotten 7 consecutive second-place finishes. But there was always someone else who managed to bring a slightly harder conditioning to the stage and beat me. 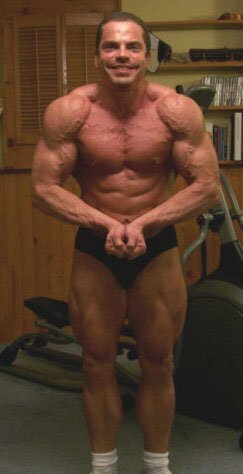 I could always get lean, but I never got that rock hard conditioning that is needed to win bodybuilding contests these days. So this year I was determined to buckle down and get into my best contest condition ever. 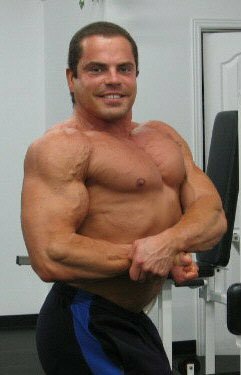 The Heavyweights Classic Bodybuilding Competition was coming up on November 17, 2007 and I started dieting for that contest a full 6 months out. In the past I would only diet for a contest for 3-4 months. My Best Contest Condition Ever. 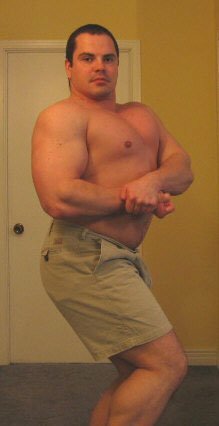 So back in May 2007 my off-season weight was a thick and bulky 240 pounds. (which is pretty darn big on a 5'6 1/2" frame). I started cleaning up my diet by cutting out all obvious junk foods and I started doing 30-60 minutes of cardio every morning. Usually taking my dog for a walk outside or if the weather was bad I'd do my cardio indoors. I have an elliptical machine and a stepper set up in front of the television at home. As the weeks went by I gradually tightened up my diet and by 15 weeks out from the contest I was down to 220 pounds. and already pretty lean with visible abdominal definition. And from then on I kicked things up a notch to make the transition from being lean to getting ripped. As the weeks went by the body fat melted off and I was getting harder and leaner. I could tell by the final few weeks out from the contest that I was in my best shape ever and would be hard to beat. 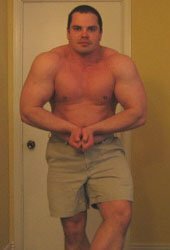 I was bigger and leaner than I had ever been before going into this contest. In My Best Shape Ever. I was in the low 200-pound range a couple days before the show and the cut off for the light-heavyweight class is 198 so I knew I'd have to "make weight." The weigh-in was Friday night before the Saturday show. I cut my water 6 hours prior to weighing in, took some herbal diuretics, and ate little food in order to lose those last few pounds of bodyweight. When it was my turn to step on the scale, I weighed-in at exactly 198 pounds on the dot. I was the biggest competitor in the light-heavyweight class. 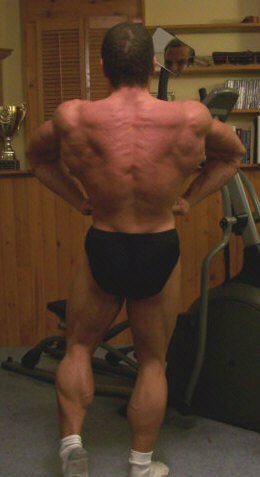 Even though I was in my best shape ever, I thought going into the night show that one of the other competitors, Andy Pratt, would beat me in the light-heavyweight division because he was so bone dry and shredded. I thought for sure the judges would give it to him. Even though I knew I had a lot more muscle mass, the judging seems to go in favor of the most conditioned competitor. 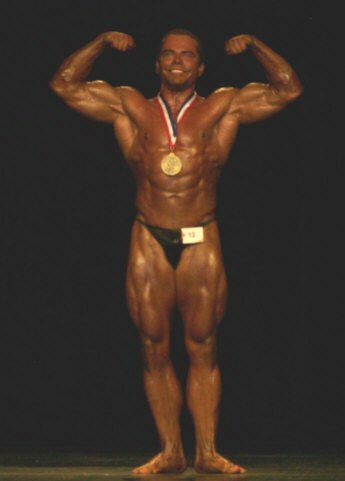 And the last time I competed provincially Andy Pratt had beat me and won the overall. In the finals when the MC was announcing the places and she came to "in second place ... " I just put my head down and started to feel my gut cringe because I've been in the spot so many times before. I was waiting to hear my name ... But she announced Andy's name in second place instead. I just got so overcome with emotion that I couldn't hold it in and I just filled up with tears on stage, it meant so much to me to finally get a win after 12 long years of competition. All the months of dieting, all the countless hours of cardio, all the workouts, all the posing practices, had finally paid off. Then I went into the overall to battle it out with the other weight class winners. And while the competition was tight, it wasn't as close as it was in the light-heavyweight class. And by the end of the night when the dust settled, I was the last man standing on stage with my first overall victory. I can tell you first hand that the longer you have to wait and the harder you have to work toward achieving a goal just makes the victory that much sweeter when you finally achieve it. I wouldn't trade the feeling I have right now for a million dollars. During the last few months leading up to the contest I'd start my day with 1 hour of cardio before breakfast. Breakfast was always 1 cup of oatmeal and 8 egg whites and 2 whole eggs. I'd scramble the eggs and mix them in with my oatmeal along with a scoop of whey protein and then add some artificial sweetener and cinnamon for taste. For my mid-day meals I'd eat only lean protein and green veggies. Usually a large garden salad with a 4 ounce chicken breast or can of tuna and mixed in. I'd top it off with some low calorie salad dressing. I'd eat this salad every 2-3 hours during the day. Then I'd do my weight training workout in the afternoon. After my workouts I would eat a meal containing protein and carbs. Usually an 8 ounce eye of round steak, a couple yams, and some steamed green veggies like broccoli. Then before bed I'd usually have another chicken salad or a protein drink. The key to my diet was a tip that I got from Dr. John Berardi, which was to only eat starchy carbs after exercise. For the rest of my meals I'd eat only protein and green veggies. With my breakfast and post workout meal I would take a multivitamin, vitamin C, vitamin E, Vitamin B complex, glucosamine, and fish oil capsules. I would also take a couple fish oil capsules with every meal during the day. Before my cardio and weight training workouts I would take 2 caps of "Palo Alto Labs Leviathan" and a caffeine pill. This helped give me an energy boost and also helped speed up fat loss. Before my weight training workouts I would take a Nitric Oxide drink such as Superpump250. 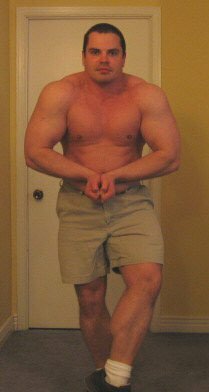 This enabled me to train hard, feel strong, and get a good pump while training even though I was on a calorie restricted diet. I would include protein powder such as 100% Optimum Whey Protein. I'd mix a scoop in with my oatmeal in the morning and sometimes I'd have a protein drink in the evenings. But I usually try to get the majority of my protein from real food when dieting for a contest as I find it a lot more filling and satisfying then drinking shakes. I'd also have a greens drink twice per day in between meals. I find greens help control my appetite and also provide much needed phytonutrients and antioxidants. 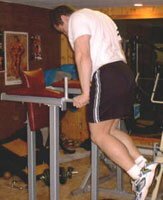 For my workouts I used the training principles of "Positions Of Flexion." Which basically means that every body part is trained through the entire range of motion with a heavy compound mid-range exercise, a fully-stretched exercise and a peak contraction exercise. In anatomy, flexion is a position that is made possible by the joint angle decreasing. The skeletal (bones, cartilage and ligaments) and muscular (muscles and tendons) systems work together to move the joint into a "flexed" position. For example the elbow is flexed when the hand is brought closer to the shoulder. The trunk may be flexed toward the legs or the neck to the chest. So in the case of chest training the bench press would be an example of a heavy compound mid-range exercise. Dumbbell flyes would be an example of a fully stretched exercise, as most of the emphasis is on the muscles in the fully stretched position. And cable crossovers would be an example of a fully contracted exercise, as most of the tension is on the muscles in the fully contracted position. I'd vary my exercise variations every few weeks to work the muscles from different angles and to prevent boredom with my workouts. Note: I'll do a couple warm-up sets prior to doing my heavy sets for each exercise. Finish off with 100 total push-ups. I'll do as many sets as needed to get 100 total reps.
Click Here For A Printable Log Of Lee Hawyards Chest & Shoulders Workout. Note: I'll do a couple warm up sets prior to doing my heavy sets for each exercise. I'd really emphasize the peak contraction with each rep. 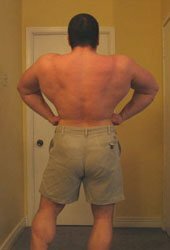 I'd really emphasize the stretch in the lats with each rep. Finish off with 100 total hyperextensions. Just using my bodyweight I'll do as many sets as needed to get 100 total reps.
Click Here For A Printable Log Of Lee Haywards Back Workout. I'd really emphasize the stretch with each rep.
Click Here For A Printable Log Of Lee Haywards Biceps & Triceps Workout. Decline Bench Sit-ups - 100 total reps. Just using my bodyweight I'll do as many sets as needed to get 100 total reps.
Leg Raises - 100 total reps. Just using my bodyweight I'll do as many sets as needed to get 100 total reps.
Crunches on the stability ball - 100 total reps. Just using my bodyweight I'll do as many sets as needed to get 100 total reps.
Click Here For A Printable Log Of Lee Hawyards Legs & Abs Workout. The best advice I can give to others is to be consistent and stick with it. All too often people get discouraged and quit if they don't make fast progress. But if you can simply hang in there and focus on making small improvements over the long term you'll eventually get the results you are after. In my case it took my 12 years of bodybuilding competition to win my first show. And looking back over everything I wouldn't change a thing even if I could. The discipline, character and work ethic that I've developed over the years means a lot more to me then if I had achieved fast success. You need to focus on your own improvements and don't get hung up on everyone else around you. 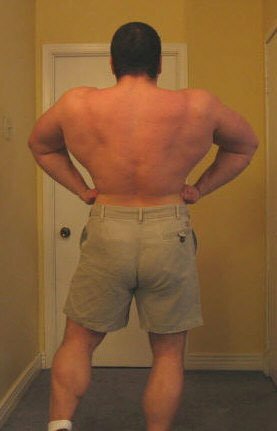 There will always be people who are bigger, stronger, leaner, have better genetics, etc. But don't let this discourage you, just be the best you can be and take pride in your accomplishments. Set realistic goals for yourself and do something everyday to help move you in the right direction towards achieving those goals. And when you run into temporary set backs and don't achieve your goals within a certain time frame, then just re-evaluate your approach and re-set your goals. There is no such a thing as failure unless you give up.